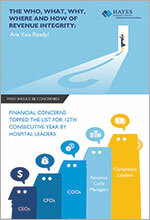 Thanks for your interest in our infographic, The Who, What, Why, Where and How of Revenue Integrity, Are You Ready? Who should be concerned about revenue integrity? What it is and why is it crucial to your organization's health? This infographic shows where you should be focusing, how to implement a revenue integrity program, and the bottomline results you can expect. Infographic: The Who, What, Why, Where and How of Revenue Integrity: Are You Ready?